Home / Learning Centre / Introducing dogs to your chickens! You've dreamt about having a small backyard flock of chickens one day. What about the family dog, though? How will it react to its feathery new siblings? 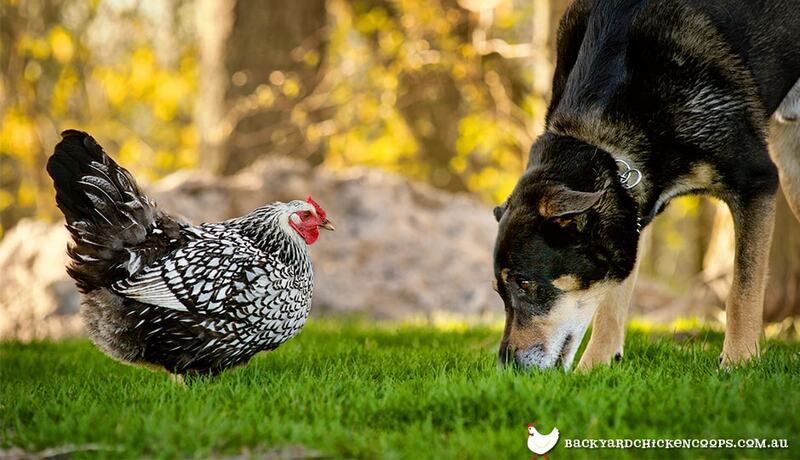 No worries…dogs and chickens can definitely share the same family and go on to bark and cluck about it for years to come. Some simple advice, though, will help to ease the transition from “only canine” to canine and chickens. Follow these 5 basic steps from establishing the appropriate relationship with your dog to sharing the backyard happily ever after and you just may end up with some inseparable siblings-furry and feathery, but inseparable none the less! Also, check out the links in this article for some of our real life stories of pooches and chooks becoming best mates. The most important thing to remember when introducing chickens to your lovable family dog is that it’s all about the R word-relationship. A mutually respectful relationship between you and your dog is based on trust. A dog who trusts that you are in control and will take care of all of its needs will recognize and respect you as its master. One of the best ways to foster trust in your dog is to train him. All dogs can be trained. It’s just a matter of time, effort and passion- passion for moulding your dog into the best dog that he can possibly be and to be CONSISTENT! So, obedience training isn't just all about the work- it’s also about spending quality time with your dog. So teach your dog basic commands such as sit, down, stay, leave, and come. Having a well-trained dog blesses your family twofold-a nicely trained dog is easier to handle and a pleasure to take places and your dog, being a pack animal, will reap the reward of knowing his place within the family pack and will consequently feel more secure, confident, and trusting. Now that’s egg-actly the type of dog you want to introduce to your new chooks! Now, once you’ve established a strong Master Dog relationship and show him his place in the pack (family) and he has learned basic obedience, you’re ready for Step 2. Yay! Congratulate yourself. On to step two! A great way to increase the likelihood that these introductions will go well is to prepare your dog-a happy, satiated, well-exercised dog will be so much more apt to greet his new feathery siblings with calm, gentlemanly manners. So, take your dog on a nice long jaunt, play a game of fetch, practice some tricks that you’re working on, or if he’s a water lover, let him romp in a nearby stream or lake. Whatever your dog’s favorite activity…enjoy this time together! Then, feed your dog as you normally would. In the wild, birds are natural prey to dogs, so ultimately, you want your dog to not be thinking about his rumbly tummy when introducing him to chickens. Now, let the introductions begin! 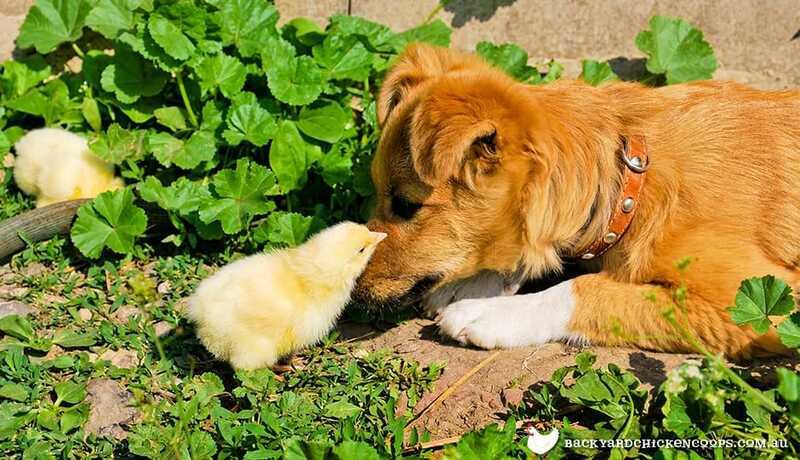 Introducing a dog to young chicks is not as daunting as it may sound. 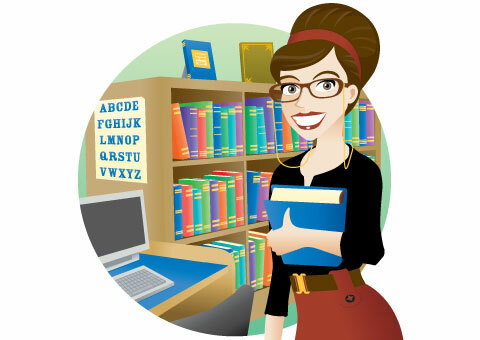 With a few simple precautions, the initial introduction should go well. First, allow the chicks to settle in to their new home for a couple days. After this, they'll be accustomed to you popping in and out for feeding, cleaning, and visiting and will hopefully not be as skittish. Now, it’s time to introduce your dog. First, put your dog on a short leash for better control, walk him over to the brooder, and place him in a sit stay. Allow him to watch the chicks and get acquainted with their scent. Your sweet pup may be a bit wiggly and whiny at first. This is normal. Offer him some comfort by petting him and talking calmly to him. Continue to observe his manner and praise him and reward him with a favourite treat for calm quiet behaviour. Show the dog that you care about these fuzzy little peeps by talking to them, reaching in and petting them and holding them. Your dog will pick up on this. If you feel comfortable, feel free to pick up a chick and hold it near your dog to sniff. If he’s anything like my pup, your fuzzy chicks will not only be sniffed and poked, but they'll also get a nice bath. If on the other hand your dog is not able to sit stay and is quite restless, remove him from the room as your peeps will be stressed by the cacophony in the room. Repeat this process every day until your dog behaves appropriately. Hopefully with time, your cute canine companion may decide that these fuzzy little peepers are “not all that” and just lie down and take a nap. Next, comes the outdoor meet and greets. Soon your fuzzy chicks will be sprouting combs and feathers and growing by leaps and bounds. And, soon they will move outside into their coop. Or if you purchased chickens at the Point of Lay stage or adopted adult chickens from friends, you will be introducing them to your dog outside. This step is important because up until now, the backyard has been solely the dog’s domain. First, I suggest allowing the chickens a few days to settle into their new home and explore their coop and backyard canine free. Then, put the dog on a short leash, walk him toward the chicken coop until you’re about 30 meters away and place him in a sit stay. Praise him and reward him with a treat for good calm behaviour. After he’s sat calmly for a while, move closer to the chicken coop to about 10 meters away and again, put him in a sit stay. Continue to praise his efforts. Eventually, walk him right up next the coop and place him in a sit stay, all the while praising and rewarding positive behaviour. If he behaves appropriately, lengthen the leash and allow him to wander around the outside of the coop. He'll enjoy sniffing and poking around. If he gets too nosy, he'll get a peck on the cheek for sure, but won’t go poking his nose in where it doesn't belong again any time soon! Now it’s time to mingle. While being outdoors together does some new concerns, all of the work you've done up until now has only been serving to ready your dog for his new role as friendly sibling and perhaps even, shepherd. First things first-will the chickens free range? If so, how will this affect your dog’s daily routine? If your dog is normally let out into the yard without a leash or cable to do his business, then you'll need to put his free roaming temporarily on hold while you introduce him to the new backyard dynamics. Again, put him on a short leash and walk him out to where your chooks are exploring and foraging. Put him in a sit stay. . By verbally commanding your dog to sit, stay, etc. you are not only diverting his attention away from the chickens, but reminding him that you are the leader of the pack. Engage your canine companion by simply talking to him and calling him by his name. This also focuses his attention onto you instead of the chooks. Give him a bone or favourite toy and continue to praise him. Feel free to walk him in and amongst the crowd of chooks-they’re just as curious about that odd four footed creature as he is of them! Eventually, those clucky squawky birds won’t be so new any more and hopefully not as interesting. Time is your best friend. Anyway, make no bones about it, a dog’s got bigger and better things to be doing outside than bothering with birds. 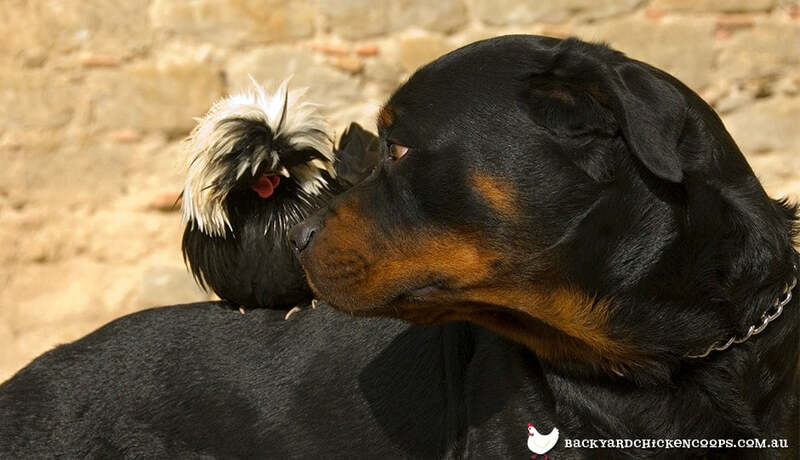 And maybe one day, your dog will be completely trustworthy and able to mingle with his chickens as a solo act! Remember though, that not all dogs will get to this point. Some may always need a bit of supervision or the control of a leash. So, now that your dog has conquered being friend not foe to your chooks, keeping him from devouring the chicken poop, chasing chickens for fun, and herding chooks when they need not be herded should be easy as pie! Happy tail waggin’ and wing flappin’ fun to you!